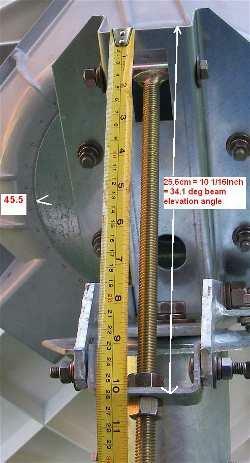 How to set the elevation angle on a Prodelin 1.2m F/D=0.8 dish. Do not use these instructions with other antenna positioners. Study the image on the right. By altering the distance from the edge just above the elevation screw T bar to the underside of the cross piece where is the lower nut, it is possible set the approximate elevation angle. The measurements apply assuming that the top of the canister is level and that the main azimuth bolt is tightened down so that azimuth movement is still possible but that there is no significant sagging down of the dish. If the azimuth bolt is looser then the dish will sag down a bit and you will need to use distances a few mm less to pull the dish up a bit. If your required elevation angle is very low, below 11.5 degrees, you will need to flip the lower U cross piece upside down, but it is then more difficult to turn the elevation nut with a spanner. If your required elevation angle is very high, above 87 degrees, it is suggested that you remove the large flat washer on the main azimuth bolt and the two flat washers on either end of the T bar at the top of the elevation screw. At 90 deg elevation (straight up) the mechanism is completely closed. For angles slightly away from 90 deg the metal appears at the rate of approx 3.8mm per degree. Hughes and HughesNet and HX are trademarks of Hughes Network Systems, LLC.